We don't have any control over #1, the mechanics of the barrel was fixed when the gun was designed. 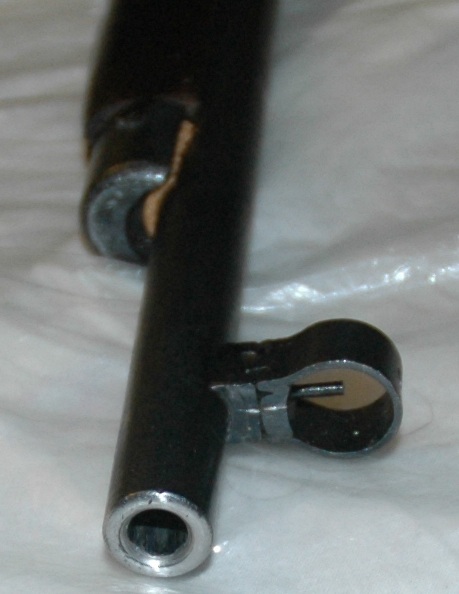 Note that the thickness of the barrel per se does not lead to accuracy in and of itself. However, a thicker barrel dissipates the heat quicker and more evenly, and therefore is less susceptible to thermal warping and other changes of geometry as it heats up during shooting. This is why benchrest barrels are rather thick. If one allows the barrel to cool down to uniform temperature, a thin barrel would be as accurate as a thick one. Similarly, for a mid-power 30 caliber bullet the length of the barrel does not contribute to accuracy, and a super-long barrel such as Mosins can even reduce it somewhat because of the whiplash effect. Most of the speed for the 30 caliber bullet, especially when using normal loads, is actually acquired during the first 24", so the last 4" of Mosin's barrel are simply not productive. Be it as it may, we really only control #2 when we buy the rifle. Make sure you inspect the bore carefully when you buy in at the retail store, or pay extra $30 to J&G Sales so they do it for you when you buy it on the internet. #3, the weight of the trigger is the force with which the trigger needs to be pulled for the rifle to go off. A typical military rifle has a 8lb trigger weight. a typical benchrest rifle's trigger pull is measured in ounces. The heavier the trigger, the more the rifle is deflected by the finger pulling the trigger, the more variance on the impact point and the wider is the group. A Mosin trigger is an extremely simple system, it is typically very heavy, and has no support for adjustment. You can lighten it somewhat by shimming it with thin pieces of aluminum (e.g. cutouts from the soda cans) by putting them between the receiver and the base of the trigger spring, but unless you are ABSOLUTELY SURE that the rifle will only be loaded at the range and only when pointing towards the target, I STRONGLY recommend against doing it. A trigger modified in this way can go off on its own - or if the rifle is struck - at any point, which makes the rifle extremely dangerous. So it is #4 and #5 that an amateur (and not so amateur) gunsmith can control to improve the accuracy of his or her rifle. This is what I am going to describe here. The rules around the stock are extremely easy: you should avoid having barrel touch the stock at all costs; conversely, the receiver should contact the stock as tightly as possible. The techniques that ensure that are called "free floating the barrel" and "glass bedding the receiver". To test that there is no contact between the stock and the barrel, put a dollar bill between the stock and the barrel forward of the corkboard shim and slide it towards the receiver. The paper should slide freely. If the shot group has a wide (2"-3") dispersion in the vertical axis the culprit is almost always the bad contact between the stock and the receiver. To fix this, the receiver is "bedded" into the stock with a layer of epoxy. Alongside free floating the barrel, this is the best way to improve the accuracy of an existing gun. To do this, the bottom layer of the receiver is covered with a release agent to make sure that epoxy does not glue it to the stock, the layer of epoxy is then placed on the stock near the recoil lug (the front part of the receiver), and the rear screw. 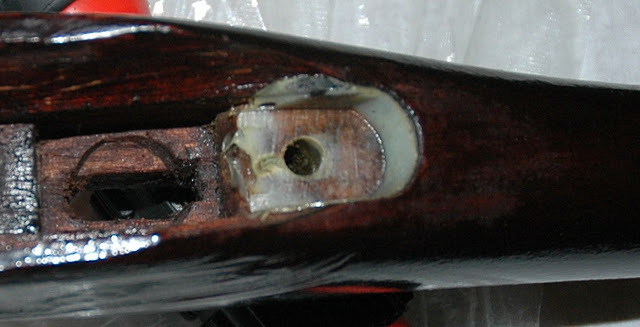 The receiver is screwed in lightly, the layer of the epoxy that squeezes out from the sides is removed, and it is left to sit for a period of time. When the epoxy hardens, the receiver is lifted out of the stock, the release agent is cleaned off. Then the gun is put back together using normal (high) tension on the screws, and left alone for another 4-5 days until the epoxy cures completely. The results should look something like the following. 1) I have used both the Acraglas Gel (you can find it at http://www.brownells.com/) and JB Weld (the technique is described here: http://www.theboxotruth.com/docs/edu75.htm) and the results seem to be the same with JB Weld being much cheaper ($6 vs. $25). 2) If you do use Acraglas, be sure to use the car wax as a release agent (again, see here: http://www.theboxotruth.com/docs/edu75.htm for the pictures), the release agent that ships with the kit does not work very well. 3) Less is more in this case. You can always repeat the process if you put too little, but if you put too much, you will have sticky goo all over your stock, the barrel, and the receiver that will be hard to get off. 4) Remove a 2-3 mm layer of wood saturated with oil and lacquer from the bedding area using a Dremmel tool. If you don't, the epoxy mold may not stick, or you will have contact problems between the bedding and the wood. 5) If you use Acraglas, be sure to read the manual completely before starting.